One of the most fascinating spectacles to greet scuba divers on the southern Spanish coast comes in the form of a marine species that – if it actually had a brain bigger than a peanut – would probably develop a serious case of identity crisis. Called “Swimming Head” (Schwimmender kopf) by some in Germany, the same fish is referred to as “Putol” (Cut In Half) in the Philippines, while the Taiwanese opt for “Toppled Car Fish” and the Danish and Norwegians settle with the very descriptive “Klumpfish”. 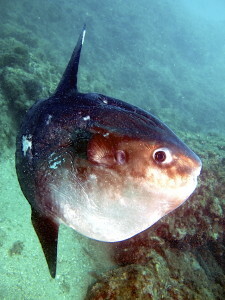 The magnificent Ocean Sunfish at Marina del Este, one of the most popular dive sites on the Costa del Sol. Of course here in Spain at least some sense prevails and the biggest bony fish in the world is called “Pez Luna” (Moonfish), probably the most pleasant of the monikers and closest to what us English speakers call the “Ocean Sunfish”. Its common name comes from its habit of lying flat on the surface of the ocean appearing to catch the warmth of the sun’s rays. This thermal recharging is thought to be essential after deep dives to hundreds of very chilly metres and it’s while sunbathing that it’s most often spotted by us divers. 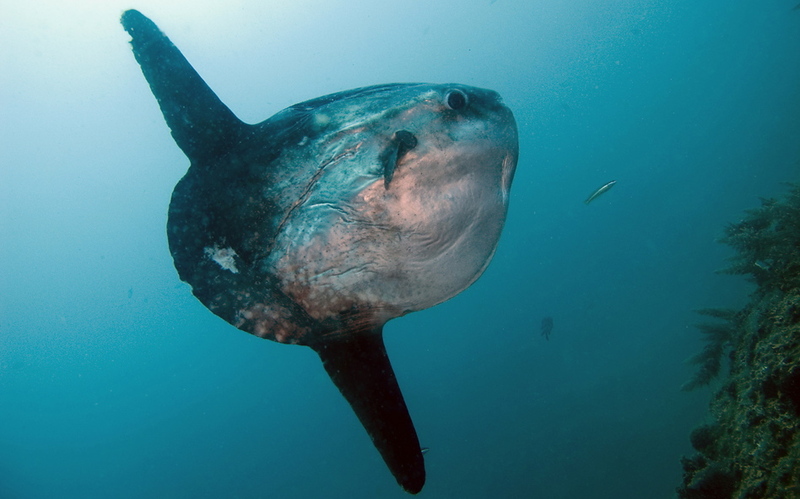 “Sunfish” is actually used to describe the entire marine family Molidae, while its Latin name Mola Mola translates literally as millstone millstone, in reference to the fishes’ circular bodies. Their odd appearance makes them look like large heads equipped with long sweeping fins, with their body less than twice as long as it is deep. They have a rounded tail and gritty skin that feels like sandpaper covered with mucus: perfect for protection against their favourite meal of jellyfish. Typically silver in colour, they can exhibit strikingly changeable spotty patterns and sometimes appear black. 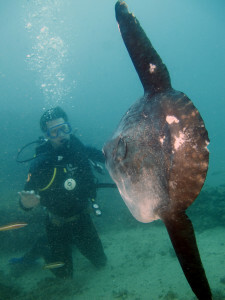 But their popularity with scuba divers here on the Costa del Sol is not only due to their uniqueness, but the fact that this bizarre fish can reach more than four metres across – the size of a minibus – and weigh up to 2,300kg, which is about the same weight as an Asian bull elephant. A diver comes face to face with the Sunfish. Perhaps more remarkable is the fact that if it lives to adulthood, a Sunfish can gain over 60 million times its birth weight: the equivalent, says the National Geographic, of a healthy, bouncing baby growing to the size of six Titanics! Despite their brain being literally the size of a peanut, weighing in at 4g, the Sunfish has entered the Guinness Book of Records as one of the most fecund vertebrates in the world, with one particular 1.5m-sized female recorded as producing an estimated 300 million eggs. Despite this overwhelming productivity, they’re very vulnerable to fishermen’s nets, getting caught in huge numbers as they laze on the surface. Another hazard is the dreaded plastic bag, that appears to a mola like a jellyfish. Thankfully their numbers seem to be healthy here on the coast, with Simply Diving staff recording record numbers of sightings in 2012. 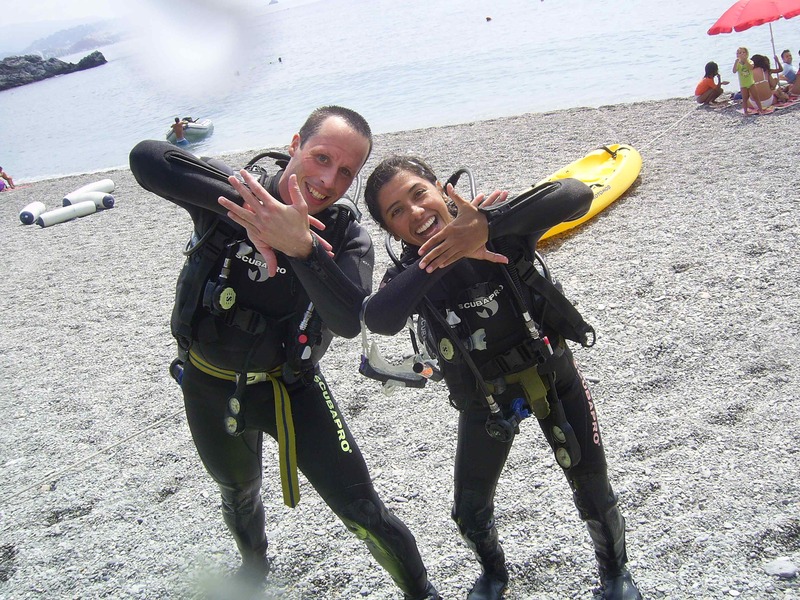 Divers give the Sunfish sign after a chance encounter. I absolutely love Sun fish. It’s so nice to hear someone being as passionate about them as I am. Have only seen them in Thailand, so will make sure to make the Costa del Sol my next port of call for some Sun fish diving. Cheers!